Once again, the seasons are changing. The leaves on the trees are falling and the flowers that once where so lovely have become brown. The longest Season of the Church’s Year is drawing towards its end, and we celebrate Christ the King Sunday, the last Sunday in Ordinary time before Advent. 23:33 When they came to the place that is called The Skull, they crucified Jesus there with the criminals, one on his right and one on his left.34 Then Jesus said, "Father, forgive them; for they do not know what they are doing." And they cast lots to divide his clothing.35 And the people stood by, watching; but the leaders scoffed at him, saying, "He saved others; let him save himself if he is the Messiah of God, his chosen one!" 36 The soldiers also mocked him, coming up and offering him sour wine,37 and saying, "If you are the King of the Jews, save yourself! 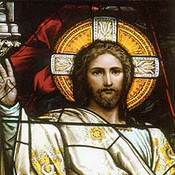 "38 There was also an inscription over him, "This is the King of the Jews. "39 One of the criminals who were hanged there kept deriding him and saying, "Are you not the Messiah? Save yourself and us! "40 But the other rebuked him, saying, "Do you not fear God, since you are under the same sentence of condemnation? 41 And we indeed have been condemned justly, for we are getting what we deserve for our deeds, but this man has done nothing wrong." 42 Then he said, "Jesus, remember me when you come into your kingdom." 43 He replied, "Truly I tell you, today you will be with me in Paradise." Time marches on, and as a tired world complains of Christmas shopping and economic meltdown, let us remember, how and why we travel this road with Christ at all. Shepherd of Israel, hear our prayer as Your Son heard the plea of the criminal crucified with Him. Gather into Christ's holy reign the broken, the sorrowing, and the sinner, that all may know wholeness, joy, and forgiveness. Amen.